In this 290 page book, Donald Trump does not make an appearance until page 210. This is not what you’d have expected, given the media focus on the sacked FBI director’s account of his meetings with the American president. 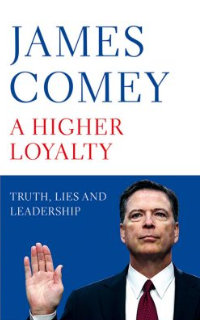 The first 210 pages of the book describe in considerable detail Comey’s career as a prosecutor and senior figure in both the Department of Justice and later, the FBI. And in those pages we learn about Comey’s values, the lessons that he’s learned, and what makes him a formidable threat to the Trump presidency. One has to read his account of the Cosa Nostra, which he investigated and prosecuted, to fully understand the horror of his well-publicised description of Trump as more like a crime boss than a political leader.